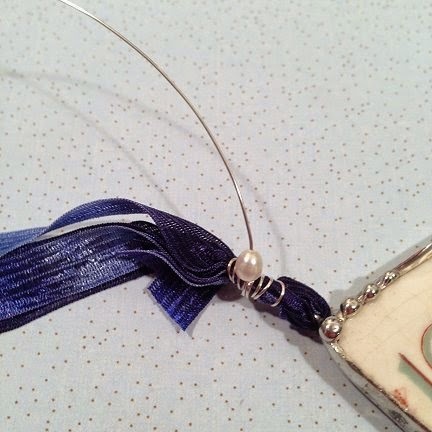 Using pretty ribbon is a great alternative to standard chain when creating a necklace! 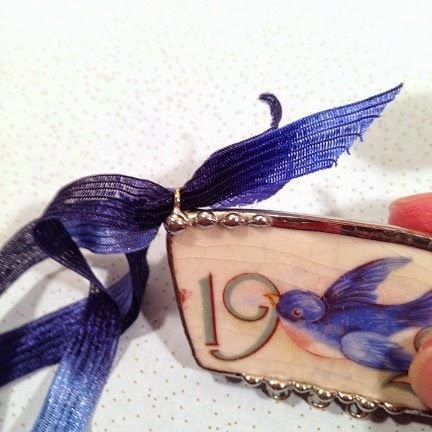 Ribbon adds color, charm, and softens the allover design of your project, and is a great way to give your jewelry projects a unique, personalized look. 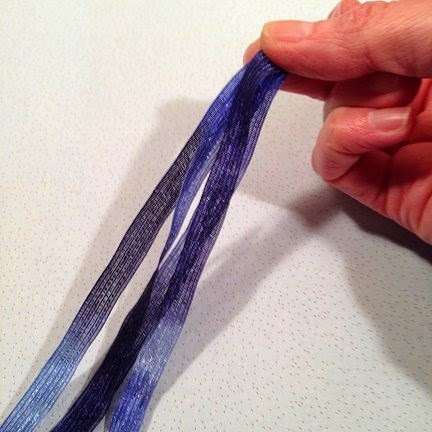 For the project in the photos, I used a 3/8" wide (9.5mm), soft, ombre dyed ribbon. 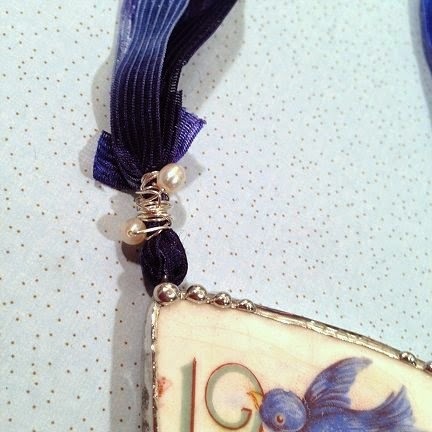 The 3/8" is my personal ideal ribbon width for ribbon necklaces, but you can use wider or narrower ribbon if you like. 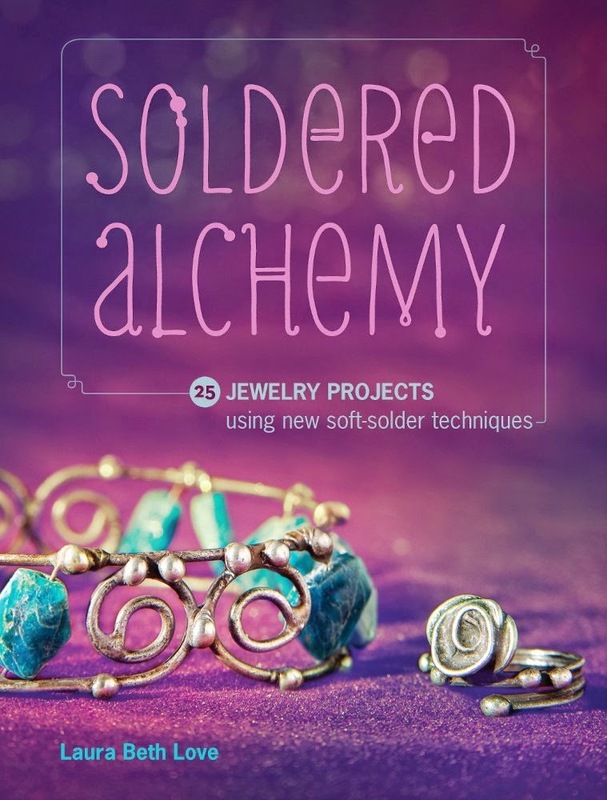 Just don't go too thin or too wide or you may find it difficult to wrap with wire. 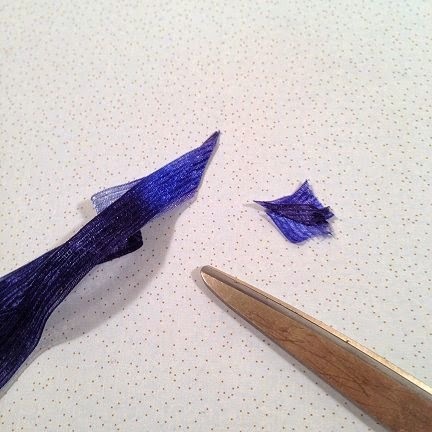 The same goes for stiffer ribbon materials. 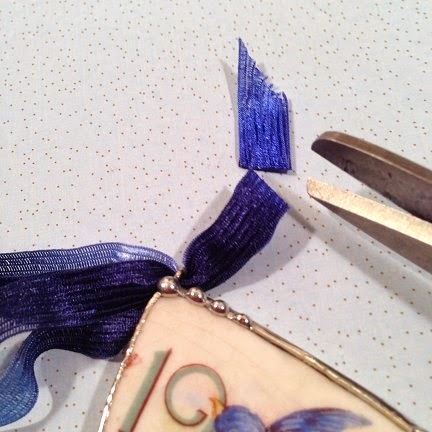 I find that thinner, softer ribbons are easier to wrap with wire and are easier to work with in general. You can also use as many strands of ribbon as you like. For the project shown, I used four lengths of ribbon that I sandwiched together. Idea: Try using a variety of coordinating colors together! I attached the ribbon to my focal pendant at two points by threading it through two jump rings that were attached to my pedant (one on each end of the pendant), which you will see in the following project steps. On to the tutorial! to be about 18" to 20" in length. 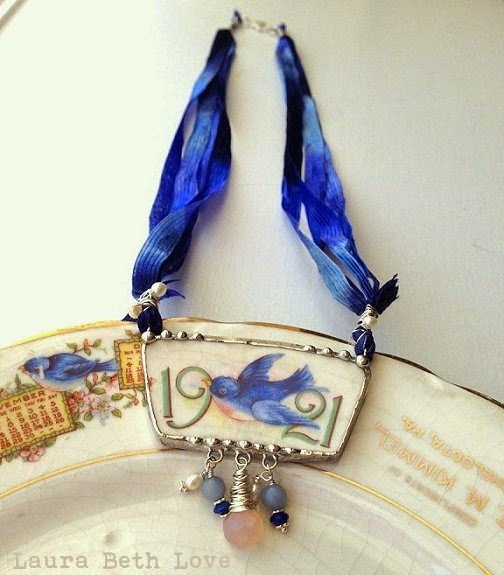 You will need two of whatever you measure - one group of ribbons to attach to each side of your focal pendant. 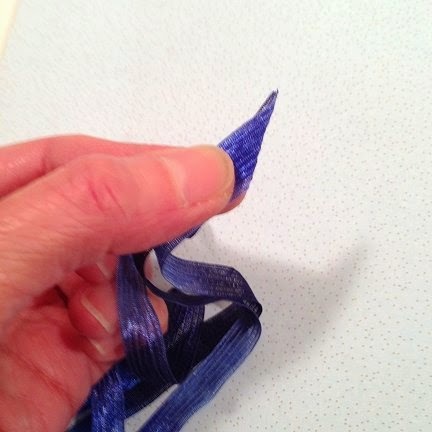 Use scissors to trim the ribbon ends at an angle so that the ends come to a point. 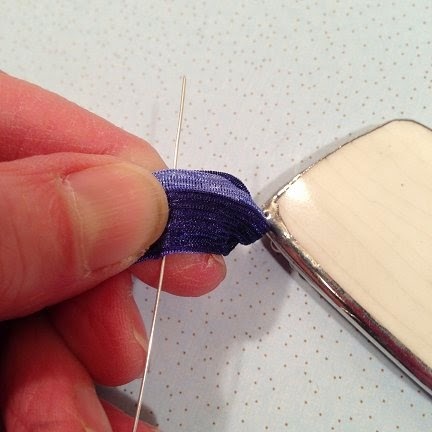 Hold your ribbon ends together, keep that point intact! 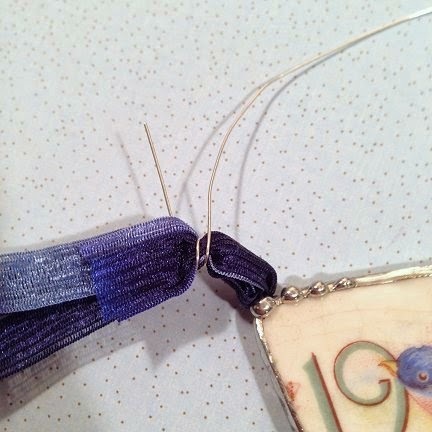 Thread your ribbon ends through the jump ring on one end of your focal pendant. together and then trim them straight across with scissors. 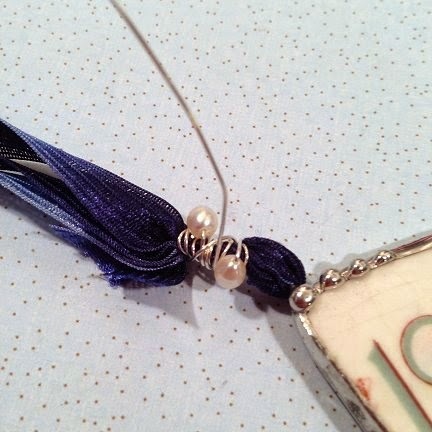 that the beads or pearls fit onto the wire before you start wrapping. keeping them gathered neatly together as shown in the above photo. weak. Make eight or nine wraps an then stop if you are planning on adding pearls or beads. 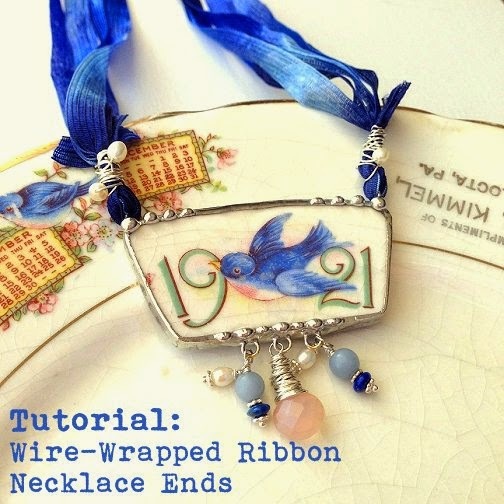 continue to make two or three more wraps around your ribbon with your wire. look of wraps that were clearly done by hand and not by a machine! ring on the other end of your focal pendant. the wire until you reach the end, tucking it into the previous wraps. 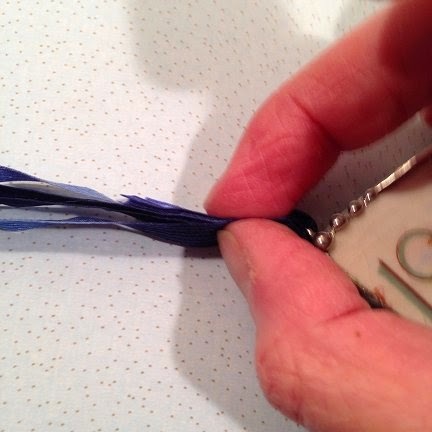 Repeat on the opposite side and then attach your clasp to one of your jump rings on one of your ribbon ends. Glad you liked it, thanks for visiting!